As I sit here in the airport waiting for our flight to leave I thought I would give some initial thoughts on expansion 3. *Worgans need some “cool” buffs. *Every expansion feels like this was their original view for the game. This is a good thing. *Many new guild options, including talent trees and guild patterns and heirlooms. All in all I was pretty impressed with what I played and saw at the panels. When I get home and have some time, I will expand on all of these points. This is a quick theme I found some where out on the internet. If I knew who it was I would give them credit. I have added a number of icons and changed a bunch to be custom. I also corrected many of the icons that were not transparent. This is for the Winterboard app on a jailbroken iPhone or iPod touch. It should be uploaded to the \Library\Themes folder. Just unzip and throw the WoW folder in there. Go to the themes list and take a look. Once I jailbreak my 3GS I plan on redoing more of the icons with an updated version fo the WoWicl collection. 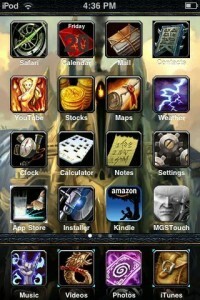 Note: This picture shows many of the icons that were broken before I updated them. All icons have transparent back grounds now. Please be sure to let me know what you think. Just waiting for the servers to come back up, hopefully by the time I get home from work. My battle group had extended maintenance scheduled today, so hopefully this will fix the instance server unavailible issue. There are lots of new features and I am looking forward to have some new fun, rather then repetitive fun. I played on the PTR and enjoyed what I saw, now I will get to do it with friends. I had a long talk with a GM last night about the problem with instances on our server. This was basically a circular argument. He did confirm it was a hardware problem, yet was unable to pass along any other information. It saddened me that Blizzard has figuratively trademarked the term Soon(TM) . He was unable to help with any question I asked. I did tell him I canceled my account due to this issue and will encourage all I know with the same issue to do the same. He basically apologized and said he would like to keep me as a customer, yet offered no real information or compensation. I am not looking for anything free, maybe a few days to compensate for the time lost bouncing off of the glowing trampoline. I was disappointed that the first time I get to talk to a GM about my issue, after submitting tickets on almost and every other day basis for a month, to be left with the same feeling of emptiness I had when I started. It would be nice if they could at least provide info other then Soon(tm) and sorry. Anyway, hopefully our issues will be fixed tonight or tomorrow, we all know patch day server stability can be rather terrible. As for now comes the badge grind. Which I am looking forward to, I have enjoyed the last few days trying to knock out the glory to the hero achievements.